Padmashri™ paint brushes are made by hand to this day. We have a strict code of standards and quality of each paint brush is thorughly checked by separate QC team before they reach the market. 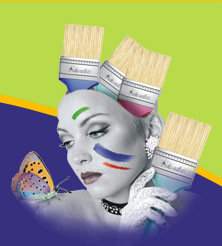 Every year we design new products than any other high-quality paint brush manufacturer. We have developed steady trade relations with over 2,000 customers. We always implement the concept of customer value creation for tailored products to meet the needs of different customers, and continuously provide customers with solutions and technical solutions. Our abundant business experience has enabled us to be a highly professional manufacturer of paint brushes in India. We have enjoyed broad recognition from Suppliers and customers in USA, South America, Middle East, South Asia and many European countries. We are ready at any time to supply you products of higher quality, more competitive price and shorter lead time. OEM orders are always welcome.